The quality and quantity of your site's organic traffic is a direct reflection of how well your content addresses the needs of searchers. Generally speaking, any tactic that aims to grow this traffic by improving your website’s value or authority is considered search engine optimization (SEO). SEO can be performed a number of ways, but two of the most popular tactics for improving a site's SEO include content marketing and link building. Content creation has recently become a real focus for businesses across different industries, but it is often chided as a “long game” and requires reasonable resources from even large organizations. No matter how big or small your organization may be, these efforts will always provide more value if they are guided by data. One of the most common concerns we hear from new or potential clients attempting to direct their own SEO and content creation strategies is that they have difficulty measuring the ongoing performance of their efforts. While we do provide custom reporting solutions for evaluating website performance, including monthly analytics and heatmapping, we often rely on the use of more advanced tools that may not fit the needs or budget of every client. Luckily, there are a number of free tools available that can help lift the veil for small business owners who are looking to get more data to inform their SEO strategies. One of the best free tools available for evaluating your site's search engine optimization approach is Google Search Console. Do you remember the first time you learned about the scientific method in school? As a young kid, I recall feeling a mix of fear and excitement as I postulated a hypothesis for my first lab experiment. Knowing that I could be completely wrong but still receive a passing grade for the assignment seemed strange, but it was the process of setting up the experiment, evaluating the data and interpreting my results that I soon learned provided the real lessons. We approach SEO for our Omaha clients with a process that closely resembles the same scientific method you learned in middle school. We rarely know with 100% certainty what the outcome will be. But we can setup a controlled environment and create a strategy for evaluating the manipulation of individual variables connected to real data. Free tools like Google Search Console can provide business owners with access to the very data points they need to perform these kinds of “SEO experiments” on their own. Consider setting up a new “SEO experiment” by using Google Search Console to track and target a specific keyword that has the potential to provide quality traffic for your website. Armed with this data, you will be prepared to write content around a new topic or improve the value of older pages to better satisfy a searcher’s needs for a specific query. If you’re convinced that Google Search Console is a tool that you should be using, follow these steps to start collecting data for your website! Begin by logging in with your Google Account, if you haven't already. Webmaster Tools will give you the option to "Add a property" to get started. Click on this button and start by carefully typing in your domain name into the field below. Be sure to check your spelling as you will not be able to verify a domain name you don't own. Each time you add a new website to Google Search Console, it is recommended that you add all versions of your domain. This includes all www and non-www versions as well as both http and https iterations of your domain. Google recommends doing this as a precautionary step to ensure that you capture as much data as possible for all versions of your domain. At the end of the day, these four URLs have the potential to be interpreted as unique websites in search results and we want to minimize the amount of duplicate content. Adding all versions and choosing a preferred one will give you the most control over how your URLs appear in search results. After you have added all variations of your domain name. Select a preferred version to let Google know how you want your URLs displayed in search results. To do this, click on the property you want to set as the preferred domain, and navigate to Site Settings by clicking on the gear icon in the upper right hand corner. After adding all versions of your domain, navigate to Manage Property > Verify. Here Google provides multiple methods for establishing a connection between your website and Webmaster Tools. While this may seem like a daunting task at first glance, there are ways to get your site verified without the need for a developer. If you have access to your site's DNS or Google Analytics account consider using one of those methods. If you have the help of a trusted developer, try pasting the verification code snippet into the header of your website. This method works similarly to setting up Google Analytics and the code snippet will not be visible to visitors on your site. 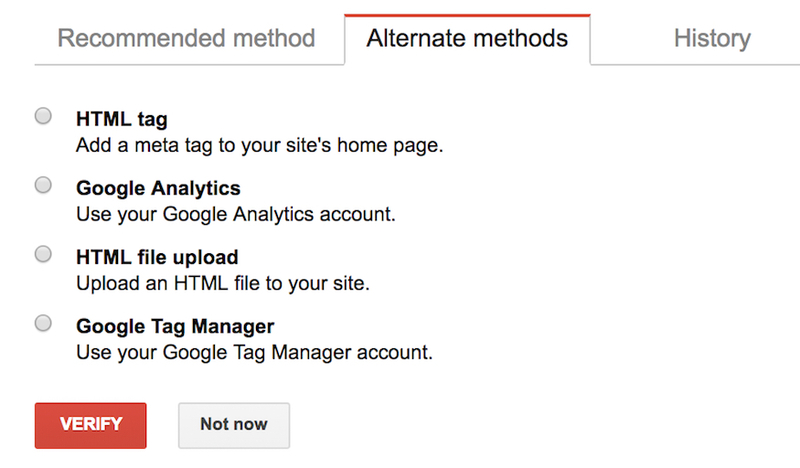 Click on the property you want to manage and navigate to Search Traffic > Search Analytics. 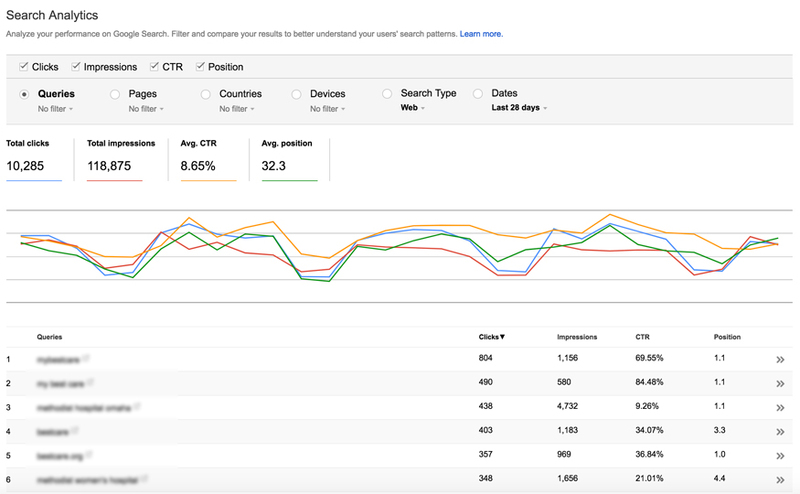 From here you can sort keyword data by the number of clicks, impressions, and CTR. This will give you a customizable view of your website's performance over a specific period of time to enable a deeper analysis. Pair these statistics with the data from your Google Analytics account to get a clear overview of where/when/why/how people are visiting your website. One of the biggest complaints from users was that Search Console only keeps data for the last 90 days. As a result, exported reports also include a maximum of 90 days of data. However, the new Search Console Beta not only lets you review stats for the entire lifetime of a site, you can also export this data for offline usage in your own reports and studies. While this beta is not live for all websites, it should be rolling out to most accounts in February 2018. 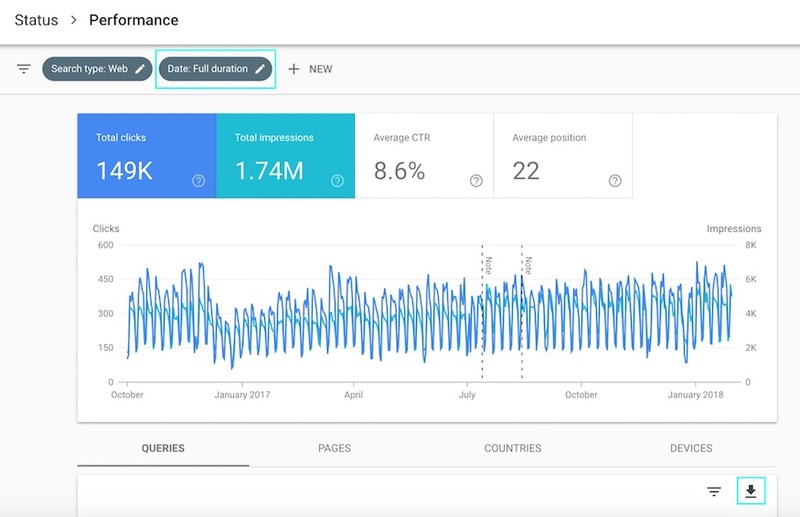 The existence of free SEO tools like Google Search Console means that anyone in your organization can begin accessing and leveraging this data for your marketing efforts (and we are just scratching the surface of what Search Console can do). If you are interested in partnering with C3D to make the most of your Search Console data and improve your site's SEO, please contact us.